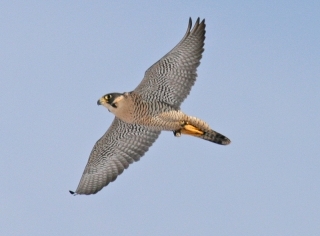 Peregrine Falcons breed in a variety of different habitats across North America. The species prefers to nest on cliffs, and the presence of suitable nest sites often determines its distribution and density. Peregrines nest in a variety of cliff types including overlooking rivers and lakes, coastal areas, and mountain valleys. They also nest on rocky islands. A nest site must afford protection from the weather and potential predators, and it must be in or near areas with an adequate prey base. Peregrines prefer to nest on tall cliffs, and nest success increases with the height and protective nature of the nest site. Peregrine Falcons avoid nesting near potential predators such as Golden Eagles and Great-Horned Owls. Successful breeders rarely change nest sites, and preferred nest locations are passed down from generation to generation. It is not uncommon for a site to be occupied for decades and, sometimes, for centuries. Peregrines often reuse not only the same cliffs, but also the same individual ledge. Nest sites vacated during the DDT era are again being used, indicating that the use of specific sites probably involves more than simple tradition. The peregrine’s tenacity to specific sites makes it relatively easy to study its reproductive success, and also has aided in its reintroduction. The species also nests in tree cavities and in the stick nests of other species, on the ground, and on manmade structures. Historically, peregrines were known to nest on old buildings in small towns, but few were observed in urban environments. This changed during the Peregrine Falcon’s reintroduction as individuals were raised and released into cities. Today, peregrines breed in many major urban areas that provide tall buildings for nest sites and ample pigeons and rats to feed upon. In 2000, there were 14 pairs of Peregrine Falcons breeding in New York City. Peregrines usually breed when they are 2 or 3 years old. Individuals that are unable to acquire nesting territories do not breed until they are older, and individuals in populations that are below carrying capacity sometimes attempt to breed at one or two years of age. Peregrines perform awe-inspiring aerial displays during courtship. The male engages in a series of acrobatic maneuvers that may include power dives, roller coaster-like flights, loop-the-loops, and figure eight flights back and forth in front of the nesting cliff. Following such displays, both the male and the female soar together. In a feigned attack, one member of the pair may dive toward the other and, in response, the “attacked” individual will roll over and presents its talons. The pair sometimes lock talons, and touch their breasts or bills together. In some cases, food is exchanged in the air. Males transfer food to the female beak-to-beak, talonto- talon, and by dropping it to the female as she flies underneath. When reintroduction efforts began, conservationists were concerned that peregrines would not breed in the confines of small enclosures that prohibited aerial courtship. Fortunately, this was not the case, and the lack of courtship flights did not prevent peregrines from breeding in captivity. Food and weather often affect productivity. Typically three to four eggs are laid usually at two to three day intervals, and pairs only raise one brood per year. Incubation generally begins when the last egg is laid. In northern areas, incubation begins after the first egg is laid and clutches hatch asynchronously. Eggs hatch 33-35 days after they are laid and the female does most of the incubation. While the female remains at the nest with the eggs and chicks, the male is responsible for bringing food back to the nest. For the first 8 to 12 days after the chicks hatch, the female broods continually. As the nestling period continues, the amount of time the female broods the chicks decreases. Once the chicks are 3 weeks old, the female leaves the nest more frequently and begins to hunt on her own. The nestling period lasts approximately 4 ½ to 6 weeks. During this time, nestlings gradually learn to eat on their own and become more mobile. By the end of this period, nestlings may have moved from the nest site to nearby ledges. Males, which are smaller than females, develop more rapidly and usually fledge several days earlier than their female counterparts. After fledging, the young stay in the area and are fed by their parents for several weeks. During this time, prey is transferred in the air and to receive food, the young may fly below and roll over underneath the returning parent. Fledglings also chase birds and catch insects during this period. As their flight capabilities increase, the young take more flights, chase each other, and engage in acrobatics similar to those that occur in courtship displays. After about six weeks, young leave the vicinity of the nest and are on their own. Peregrines search for prey while perched as well as when in flight. When breeding, adults often hunt from high perches near the nest. In fall and winter, Peregrine Falcons typically use lower hunting perches. Once a prey item is spotted, peregrines use several means of pursuit to catch their prey including the stoop, direct pursuit, “ringing up” or circling, shepherding, contour-hugging, and running along the ground. Perhaps the best-known technique is the stoop, in which the peregrine dives at high speed from a great height in pursuit of its prey. As they close in on their prey, peregrines pull out of the stoop to pursue and then grab their prey. When they are traveling too fast to grab their prey, peregrines crash directly into it. Peregrines reportedly stoop at speeds of more than 200 miles per hour. Contour-hugging involves using features of the landscape that allow the peregrine to remain hidden until it is very close to its prey. To catch birds that are flying above them, peregrines circle or “ring up” after them. When attacking flocking species, the peregrine uses shepherding and repeatedly dives at the edges of the flock until a bird breaks formation. Peregrine Falcons sometimes walk along the ground in search of nestlings, rodents, insects, and reptiles.